Update: Orange have confirmed a 10th November release date. TechRadar has spoken to Orange after it announced it will be carrying the new iPhone, with the network hinting the launch date could be coming soon. O2's exclusivity deal for the iPhone 3G and 3GS has been widely touted as ending on 8 October, two years after it announced it would be the exclusive carrier of the original iPhone. "In terms of pricing, we're going to be releasing information of that closer to the release date," an Orange spokesperson told TechRadar. "We're actually going to hold back [on price announcements] for some time, as there's no need to alert our competitors about our pricing before we need to. "But the launch date will absolutely be in 2009 and sooner than some people think. 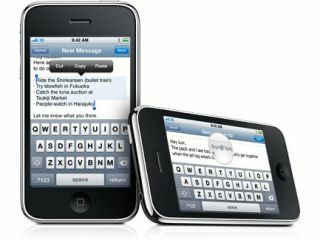 It's not going to be Christmas day as some people are saying, we're referring to it as later this year for when [the iPhone 3G and iPhone 3GS] will be in the shops." "It's very important we're competitive [in terms of pricing with O2] and we bring other interesting things to the melting pot. We'll certainly be competitive, and will offer some new angles that are different for Orange customers [over O2's offering]. "We also hope our network strength will help us stand out, as we've shown we've got the largest 3G coverage population-wise." "In terms of our signature Orange firmware we'll release more information nearer the time. We all know the way Apple operate and what other operators have managed to implement on the iPhone across the world, so it will be relatively minimal." "We are thrilled to have signed an agreement to bring iPhone to Orange customers in the UK later this year."